Sue Shepherd received her diploma of nursing from Aultman School of Professional Nursing in 1981. She received her bachelor of science in nursing in 2001 and her master of business administration in 2003 from Malone University. She has worked for Aultman Health Foundation since she received her nursing licensure in 1982 in various capacities from staff nurse to head nurse. She has been with Aultman College since its inception in 2004 holding multiple roles. She is currently the dean of student success for the college overseeing admissions, enrollment, the Student Success Center and the Academic Library. 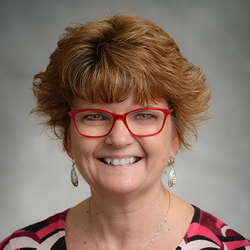 Sue is an active member of the Ohio Association of College Registrars and Admission Officers currently serving as their President, a member of the RG Drage Health Technologies Advisory Board, and she also volunteers for many community agencies and activities. Sue is married with two grown children. She enjoys traveling, reading, learning new things and spending time with family and friends.